Thanks ‘I love kc music’ for covering out album release show!! It was cold and rainy outside, but inside the recordBar there was warmth and joy. The stage glowed a rosey purple with light shining ready for the music to begin. The bar was vibrating with excitement and a love for the bands that was palpable. Last night was a night of celebration as Bob and Una Walkenhorst released their album For Tomorrow and Of Tree released How Does It Feel. 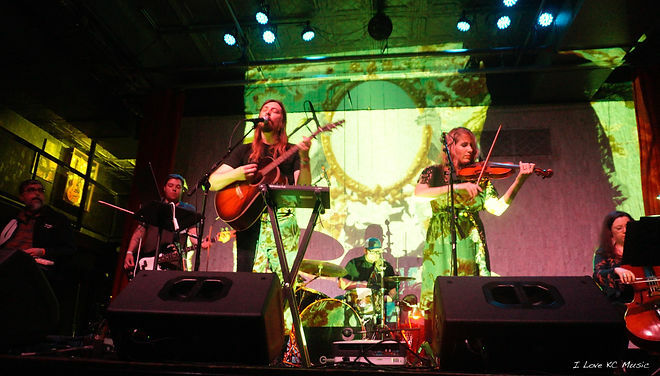 Of Tree ended the night with a floral symphony of strings and melancholy sounds. While they played their album from start to finish a dazzling projection by Lisa Marie Evans danced across the wall. A feeling of deep peace washed over the room as the audience listened intently to their songs. Their set was an epic, otherworldly dreamland of flowers, cosmic harmonies, a fusion of strings melting, and airy beats swirled through the recordBar. It was the perfect end to a perfect night of celebration.